I can't believe someone didn't think of this before. It's so brilliant! Crafty Caps from Quirky.com (again, love that name!) are bottle caps with shaped tips for painting. 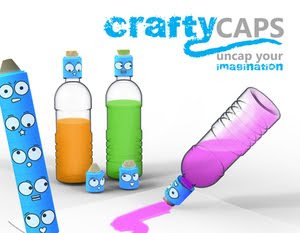 Fill a bottle with your fave colour of paint, pop on a Crafty Cap and presto, instant easy-grip paint tool! And the caps feature silly faces which are bound to please the kiddies. You can preorder these from Quirky.com at USD$7.99 for a set of 5 caps. What a brilliant (and fun!) idea!